A delicious and low calorie alternative to traditional burgers made with meat. These mushrooms have a hearty, meaty texture. Place the mushrooms stem side up and evenly apply the balsamic vinegar and the olive oil to the gills. Note: the gills will soak up the vinegar and the olive oil. Season the gills with ground black pepper and sea salt. Place the mushrooms stem side up on a hot gas or charcoal grill. Close the lid and cook for fifteen minutes. Do not turn the mushroons over once they are on the grill. After fifteen minutes, put the mozzarella cheese directly on top of the gills. 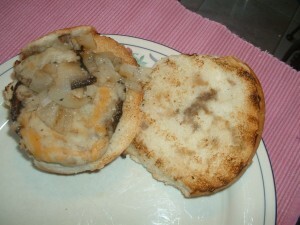 Close the lid and cook the mushrooms for an additional five minutes or until the cheese is melted. Serve on kaiser rolls. Garnish with tomato slices and/or roasted red peppers. Into a mixing bowl, add the garlic and a teaspoon of sea salt. Mash with a fork to form a paste. Add the ground black pepper and the crushed red pepper flakes. Mash again. Add the fresh thyme, the Dijon mustard, and the sherry vinegar. Whisk until well blended. While whisking, slowly drizzle in 1/4 cup of the olive oil. Continue to whisk until the dressing is creamy and thickened slightly. If the dressing appears not to be creamy, add a little more Dijon mustard and whisk again. Taste and add more sea salt and/or pepper, if desired. Set the dressing aside. Rub the peppers and the tomatoes with olive oil. Place the peppers on a hot gas or charcoal grill and cook them until the peppers are charred on all sides. Remove the peppers and let them cool for ten minutes. For best results, place the peppers into a bowl and cover the bowl with plastic wrap. Remove the charred skin, the stems, and most of the seeds. Cut the peppers into one inch strips. Season the peppers with sea salt. Place the tomatoes cut side down on the hot grill and cook for four minutes. Remove the tomatoes and cut them into one inch wedges. Season the tomatoes with sea salt. Add the peppers and the tomatoes to the mixing bowl with the dressing. Toss gently to coat the vegetables with the dressing. Let the salad cool for ten minutes and then add the basil, the parsley, and the feta cheese. Gently toss the salad again. Into a sauce pot, add the dijon mustard, the soy sauce, the brown sugar, the hot sauce, the ginger, the onion powder, the garlic powder, and the oyster sauce. Cook on medium high heat stirring constantly for 4 minutes. Remove the glaze from the heat and let it cool. Soak the wood plank in water for three hours. Remove the plank after three hours and pat it dry. Rub the salmon filets with olive oil. Season the filets with sea salt and ground black pepper. Place the wood plank on a hot gas or charcoal grill. Close the lid and let the plank sit for three minutes. After three minutes, place the salmon filets on top of the wood plank. Close the lid and let the salmon cook for fifteen minutes. After fifteen minutes, brush the salmon filets with the glaze. Close the lid and cook the salmon for an addtional five minutes. Remove the salmon with a spatula from the wood plank and serve. Into a mixing bowl, add the garlic, the crushed red pepper flakes, and a teaspoon of sea salt. Mash with a fork to form a paste. Add the red wine vinegar. Whisk until well blended. While whisking, slowly drizzle in the olive oil. Continue to whisk until the mixture is smooth and thickened slightly. Taste and add more sea salt and/or crushed red pepper flakes, if desired. Set this dressing aside. Rub the peppers with two teaspoons of olive oil. On a hot gas or charcoal grill, place the peppers stem side down. Close the lid and cook the peppers for five minutes. Turn the peppers onto their sides. Cook for an additional five minutes with the grill lid closed. Continue this process until all sides of the peppers have achieved a dark brown char. Remove the peppers and let them cool for 10 minutes. For best results, place the peppers into a bowl and cover the bowl with plastic wrap. Peel the charred skin off of the peppers and remove the stem and as many of the seeds as you can. Cut the peppers into one inch strips and season them with sea salt. Place the peppers into the mixing bowl containing the dressing and mix well. Cook the sausage links on the hot grill for approximately five-seven minutes on each side depending on the thickness of the sausages. Serve the sausage and the peppers on sandwich rolls. Into a food processor, add the basil, the spinach, the walnuts, the grated cheese, the garlic, the olive oil, the sea salt, and the ground black pepper. Pulse until smooth. Note: If all of the basil and spinach leaves do not fit into your food processor, add the leaves a little at a time and pulse them in batches. If the mixture appears too dry, add a little more olive oil. Taste and add more grated cheese, sea salt, and/or black pepper, if desired. Cook the pasta in a pot of salted, boiling water according to the package instructions. Drain the pasta well in a colander. Add the pasta and the pesto sauce to a mixing bowl. Gently toss the pasta until it is well coated with the sauce. Serve with grated cheese. Note: This dish can be served hot or at room temperature. Put the asparagus and the olive oil in a bowl. Mix until the asparagus is evenly coated with the olive oil. Sprinkle the salt and the pepper on the asparagus. Toss again. Cook the asparagus on a hot gas or charcoal grill for about 5 minutes turning once. The asparagus is done when they have obtained dark brown grill marks on each side. Rub the jalapeno pepper, garlic, and the red onion with olive oil and sprinkle these vegetables with salt and black pepper. Wrap these vegetables in aluminum foil. Rub the red bell pepper with olive oil. Place the red bell pepper and the wrapped vegetables on a baking sheet. Roast in the oven until the skin of the red bell pepper turns dark brown. Remove the vegetables from the oven and let them cool. Into a skillet, add the ground beef, a teaspoon of salt, a 1/4 teaspoon of chipotle pepper powder, a 1/2 teaspoon of paprika, and a 1/2 teaspoon of cumin. Cook on medium high heat while stirring. Try to break up the ground meat into small pieces. When the meat is browned, drain it in a colander to remove the excess fat. Remove the stem from the jalapeno pepper. Remove the stem and the seeds from the red bell pepper. Squeeze the cooked flesh out of the garlic skin and remove the outer layer of the red onion. Into a blender, add the jalapeno pepper, the red bell pepper, the garlic flesh, the red onion, the chicken stock, the tomato paste, the lime juice, 3/4 teaspoon of chipotle pepper powder, a teaspoon of paprika, a teaspoon of cumin, the oregano, and three teaspoons of salt. Blend the mixture until smooth. Taste and add more salt and/or chipotle pepper powder, if desired. Place this sauce in a shallow bowl. Wrap the corn tortillas in a damp paper towel and microwave on high for 1 1/2 minutes so that the tortillas become pliable. Dip a tortilla in the sauce to coat lightly on both sides. Put approximately two tablespoons of the ground beef in the middle of the tortilla. Gently roll the tortilla up like a cigar being careful not to break it. 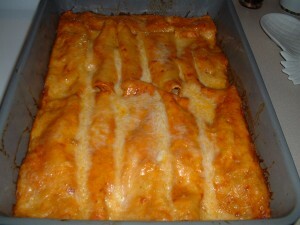 Place the filled tortilla in the greased casserole dish seam side down. Continue this process until all of the tortillas are filled. Pour the remaining sauce evenly over the filled tortillas. Sprinkle the cheddar cheese evenly over the top. Cover with aluminum foil and bake for 45 minutes. Serve with your favorite salsa and/or guacamole. Into a saucepan, add the paprika, the ketchup, the mustard, the sherry vinegar, the brown sugar, the hot sauce, the red cayenne pepper, a 1/2 teaspoon of black pepper, a teaspoon of salt, the onion powder, the garlic powder, the Worcestershire sauce, and the oregano. Cook on medium low heat stirring constantly for five minutes. Remove the sauce from the heat and let it cool. Sprinkle the chicken breasts and the chicken drumsticks with a 1/4 teaspoon of black pepper and a 1/4 teaspoon of salt. Cook the chicken drumsticks on a covered gas or charcoal grill on medium heat for 30 minutes turning the drumsticks every five minutes or so to prevent burning and to insure even cooking. Add the chicken breasts to the hot grill after the drumsticks have cooked for at least 15 minutes. Cook the chicken breasts for 15-20 minutes turning every 5-6 minutes. After 30 minutes of cooking time, begin slathering as much of barbeque sauce that you like on the chicken. Continue to cook while slathering for another 5 minutes. Serve the chicken with any unused barbeque sauce on the side. Into a mixing bowl, add the garlic and a teaspoon of sea salt. Using a fork, mash the garlic until a paste is formed. Add the thyme, a 1/4 teaspoon of ground black pepper, a 1/4 teaspoon of crushed red pepper flakes, and a 1/2 teaspoon of lemon zest. Mash again. Add the lemon juice. Whisk until well blended. While whisking slowly drizzle in 3/4 cup of olive oil. Continue to whisk until smooth and thickened slightly. Taste and add more sea salt and/or pepper, if desired. Set this mixture aside. Into a ceramic roasting pan, add the shrimp, a 1/2 teaspoon of lemon zest, the paprika, a 1/2 teaspoon of sea salt, a 1/4 teaspoon of ground black pepper, a 1/4 teaspoon of crushed red pepper flakes, and two tablespoons of olive oil. Mix well so that the shrimp gets coated with the olive oil and the spices. Place the pan with the shrimp in the oven and cook for 20 minutes. Cook the linguine in a pot of salted water according to the package instructions. Before draining, reserve a cup of the pasta water. After draining the linquine, put the linguine into the same pot that it was cooked in. Put the pot on medium heat. Add the dressing and the pasta water. Cook while stirring for 3-5 minutes making sure to coat the pasta evenly with the dressing. Add the shrimp and the roasting pan juices. Stir again. Add the parsley and the basil. Stir one more time. Turn the heat off and serve with lemon wedges and crushed red pepper flakes on the side. . I recently discovered this method of cooking pork tenderloins by accident. Usually, when pork tenderloins are cooked on a gas or a charcoal grill they have a tendency to get dry because the meat does not contain a lot of fat. This method calls for cooking the pork on a gas or charcoal grill and then finishing the cooking in an oven. The result is a good smoky flavor with moist meat. Into a mixing bowl, add three teaspoons of salt, the chili powder, the coffee, a 1/2 teaspoon of brown sugar, a 1/4 teaspoon of black pepper, a 1/4 teaspoon of red cayenne pepper, a 1/4 teaspoon of cinnamon, a teaspoon of paprika, a 1/4 teaspoon of garlic powder, and a 1/4 teaspoon of onion powder. Mix until well blended. Coat the pork tenderloins on all sides with this spice mixture. Into a sauce pot, add the ketchup, the mustard, the sherry vinegar, a 1/2 teaspoon of paprika, three teaspoons of brown sugar, the hot sauce, a 1/4 teaspoon of black pepper, a 1/4 teaspoon of red cayenne pepper, a 1/2 teaspoon of salt, a 1/4 teaspoon of garlic powder, a 1/4 teaspoon of onion powder, the Worcestershire sauce, and the oregano. Cook on medium heat for 5 minutes stirring frequently. Set the sauce aside and let it cool. Cook the pork tenderloins on a gas or charcoal grill using low, indirect heat for thirty minutes turning only once after 15 minutes. Slather as much of the barbeque sauce as you like all over the pork tenderloins. Wrap the tenderloins in aluminum foil. Cook the tenderloins in the oven for twenty minutes. Let the meat rest for 10 minutes before carving.